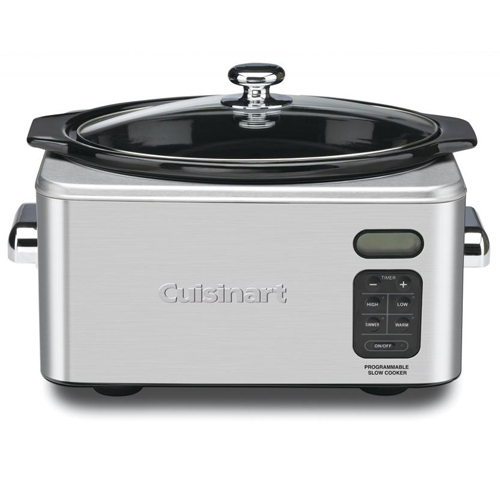 The Cuisinart PSC-650 6.5-quart programmable slow cooker is perfect for entrees, sides, desserts, and more. The slow cooker provides a user-friendly touchpad control panel and four cooking modes that include high, low, simmer, and warm. When the cook time ends, the appliance automatically shifts to the "warm" setting, so dinner stays hot and ready to serve without overcooking. The PSC-650 includes a glass lid for keeping an eye on the cooking process, 24 hour LCD countdown timer, nonslip rubber feet, and stay-cool side handles for safe transport. The ceramic cooking pot and glass lid can go in the dishwasher for quick cleanup. The Cuisinart 6.5Qt Prgmbl Slow Cooker Stnls St Nic has many exciting features for users of all types. See the Cuisinart 6.5Qt Prgmbl Slow Cooker Stnls St Nic gallery images above for more product views. The Cuisinart 6.5Qt Prgmbl Slow Cooker Stnls St Nic is sold as a Brand New Unopened Item.